"FOODS FROM the supermarket can help you meet your wellness goals if you avoid the junk and zero in on those that provide the specific vitamins, minerals, oils, antioxidants and other nutrients your body needs to get healthy and stay healthy," says wellness consultant and writer, Derek Clontz . "It features foods from every group, from fish, poultry, pork, beef and dairy to fruits, vegetables, grains, nuts ... and everything in between. "Just click on those you are interested in and you'll get information on their nutritional value in addition to the specific ways they affect your health and well-being. 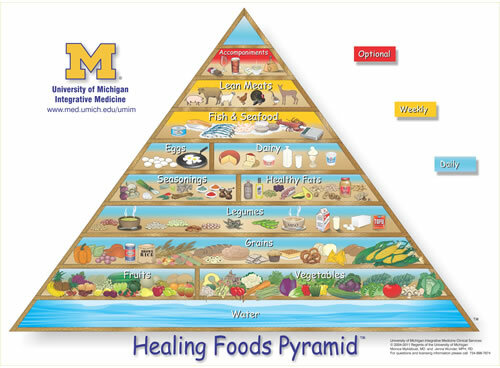 "Spend 30 minutes or so familiarizing yourself with the UM Healing Foods Pyramid, learning how to get specific information by moving and clicking your mouse. It's fun, fascinating, and rewarding. "In fact, you just might find that, before you know it, that 30 minutes has turned into an enjoyable hour. "Be sure to bookmark the page, and check back often, cross-referencing and researching the foods that you and your family are eating, and foods that might sensibly - and wisely - be added to your menus. "The Healing Foods Pyramid is a terrific reference for ominvores, vegans and vegetarians. A good Web site that targets vegans and vegetarians - veterans and newbies - is The Vegetarian Resouce Group [http://www.vrg.org/nutrition/ ] Check it out and see for yourself how interesting nutrition, and healing foods, can be. "It's your life, and your health. You owe it to yourself to make the most of both." Questions? Comments? Nutrition tip of your own to share? Write to Derek Clontz - and rest assured, he reads and responds personally to ever letter.